November 12th 2018 - November 11, our 2018 Team Golf season came to an end at the Team Golf Fall Championship at Weston Hills Country Club. We had such a fun season watching over 400 new Team Golf members compete in Palm Beach, Broward, and Lee and Collier County. The Championship consisted of 11 teams with a total of 90 junior golfers competing to be crowned the “Overall Team Golf Champion”. We had three teams from Palm Beach County, four teams from Lee and Collier counties and four teams from Broward County. All teams competed in our regular Team Golf format; a 9- hole, two-person scramble. After competition ended, we began our awards ceremony announcing the 2018 fall season League Champions. To determine our League Champions, we totaled up all the points teams had earned during the five matches that were held throughout our season. In Palm Beach County, the “Abacoa Aces” coached by Adam Foegen, PGA were crowned champions. In Broward County, the “Plantation Preserve - Team 1” coached by Nick Pincket, PGA were victorious. 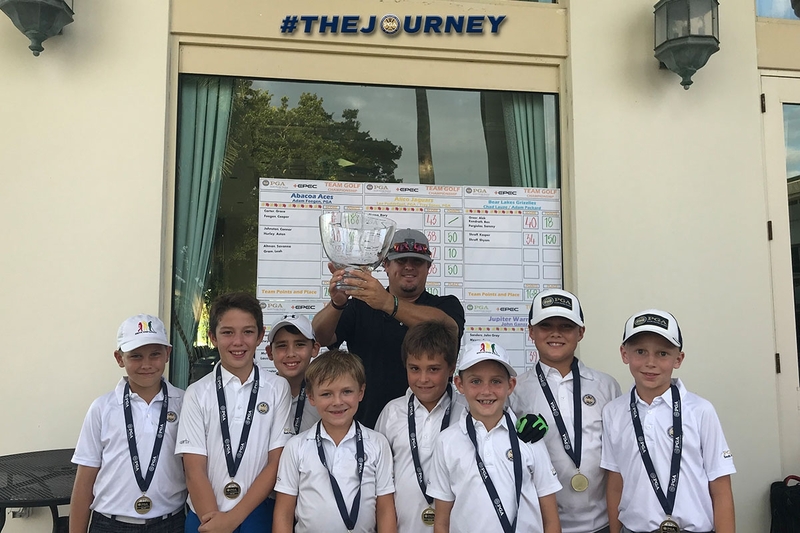 In Lee and Collier County, the “Alico Jaguars” coached by Lee Puddefoot, PGA and Trey Sonnes, PGA achieved the title League Champions. Next we handed out the crystal, our Overall Runner Up and Overall Champion were announced. In second place, taking home the Overall Runner Up trophy, was the “Weston Hills Country Club -Orange” team coached by Nick Cupper, PGA. Concluding the season in first place, winning the overall champion trophy, was the “JGPA @ Quail Creek FREEDOM” team coached by Spencer Graham. Congratulations to all of our players and coaches on a great season! Thank you to all PGA Professionals, host facilities and families who made Team Golf a complete success this year!